Sleeps 4. 2 bedroom cottage. Meadow Lodge has 2 bedrooms with super-king double or twin beds, fitted wardrobe with mirrored sliding doors and internal drawers, bedside tables with reading lamps. Console dressing table with mirror above. Countryside views. 2 En suite showers room with walk in shower cubicle, sink with mirror above, shaving point, WC, heated towel rail, storage drawers. LIVING AREA: Comfy leather sofas, coffee table, wood burning stove, 32” LED Digital HDTV with freeview , Blueray/DVD player, floor reading light, french doors to private decked area with views of the meadow. DINING AREA: Dining table and chairs, sideboard, Large French doors to private decked area with countryside views. KITCHEN AREA: Range of floor and wall cupboards, electric oven, grill & hob, Dishwasher, fridge with freezer compartment, Microwave, washing machine, broom cupboard. Dogs are not allowed in Meadow Lodge. Vines Cross Farm is located on the edge of the rural hamlet of Vines Cross, which is in the heart of the East Sussex countryside and lies within the High Weald Area of Outstanding Natural Beauty. The market town of Heathfield is 2.5 miles away. 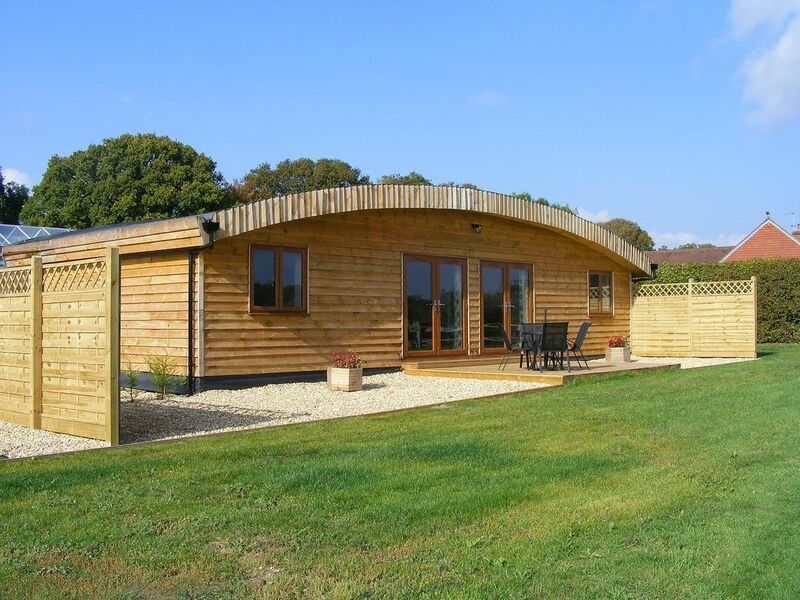 Our two holiday Lodges enjoy a peaceful setting and provide tastefully furnished, luxury accommodation with wood burning stove, super-king double beds (or twins if you prefer), en suite shower rooms with walk in shower, 32” HDTV with freeview, free WiFi and outside a private decked area with views of the meadow and surrounding countryside. We carry out our own cleaning and maintenance and pride ourselves on our very high standards. Vines Cross Farm is an ideal base for a peaceful, rural holiday with footpaths from the door, including a great Geocaching route, the Cuckoo Trail (old railway line) just a mile away for cycling or walking and many National Trust properties locally. If, on the other hand, you like a spot of serious shopping then you are only 18 miles from the spa town of Tunbridge Wells. The beaches at Eastbourne or Pevensey Bay are 15 miles away and London can be reached from Stonegate Station (8 miles). There really is something for everyone! We moved to Vines Cross Farm, a former plant nursery, in 2012. Since then we have set about developing it into a smallholding with chickens, sheep and pigs. We have also just been joined by a small herd six alpacas including two babies. We wanted to live in a rural location and start keeping livestock. Notes on accommodation: Smoking is NOT permitted in the lodges or anywhere on the farm. We provide all linen and towels, central heating, free WiFi, first basket of logs and an essentials welcome pack. Children are welcome. Dogs are only allowed in Bramble Lodge - please contact the owner for further details. Our pigs and sheep are not pets so there are times during the year when we don't have any on the farm - please ask if you require further details. Outside: The French doors in the living and dining areas of each lodge lead directly onto a private screened decking area with garden table and chairs, parasol and BBQ and views over the meadow to countryside beyond. A pebbled area each side of the deck gives access to washing lines which are in a screened area between the Lodges. To the front of the deck is an area of grass with post and rail fencing and a shared gate giving direct access into the meadow. We had a lovely stay at the lodge,ideal for visiting nearby family for Xmas,the lodge itself was clean,spacious and well equipped & we enjoyed watching the alpacas! Hopefully we will stay again in the future. Very comfortable, well equipped, and away from the bustle of normal life. Vines Cross Farm Lodges - Excellent!!! January 2018 - We were greeted by Yvonne and Anthony (the owners). The lodge was meticulously clean. Everything had been thought of to have a very welcome break. We found the beds to be of a very high quality coupled with no light pollution at night meant we were able to sleep well. A very peaceful location with a very pleasant outlook over the field with Alpacas grazing. We enjoyed 5 days in East Sussex with Meadow Lodge as our base. East Sussex offered many delights in terms of walks, coastal and rural landscapes, wonderful places to visit. Meadow Lodge was a perfect 'home' to begin and end each day - comfortable, thoughtfully presented throughout and to a very high standard - a place to relax and find some peaceful moments. The weather was mostly good so sitting outside watching the alpacas and taking in the lovely views was just what we needed - thank you Yvonne and Anthony! We were warmly welcomed on our arrival,i always book my holidays by Owners Direct and we have been in some lovely places but this one was up there with the best,everything was clean the beds so comfortable,the bathrooms were excellent.I would recommend this lodge to anyone who want to discover east sussex. A car is essential due to the rural location of the lodges. Booking Notes: A non-refundable deposit of 25% is required to secure a booking. Balance is due 6 weeks before the start of your holiday along with a refundable security deposit of £150. Bookings within 6 weeks of arrival will be charged in full. Payment accepted by online credit card, bank transfer or cheque. Please ask for full Terms & conditions. Changeover Day: During peak times changeover day is usually Saturday in Meadow Lodge and Friday in Bramble Lodge. At other times changeover day is flexible in both lodges. Arrival from 3pm departure by 10am. (times can be negotiable, dependent on other bookings) At peak times there is a minimum stay of 7 nights as indicated.